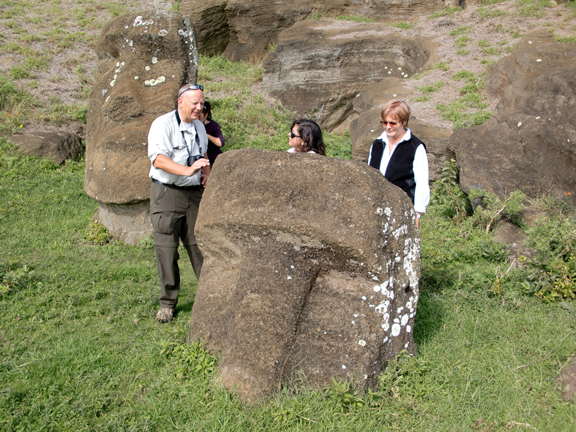 In June, 2009, Christian Fischer, Research Associate of the Cotsen Institute of Archaeology, UCLA and Mónica Bahamondez P., Centro Nacional de Conservación y Restauración joined Jo Anne Van Tilburg and Cristián Arévalo Pakarati (of EISP) in the field on Rapa Nui. Our immediate goal was a fact-finding and reconnaissance field study that would acquaint our colleagues on the AIA Project with the island sites and objects that are target concerns of our upcoming conservation work. 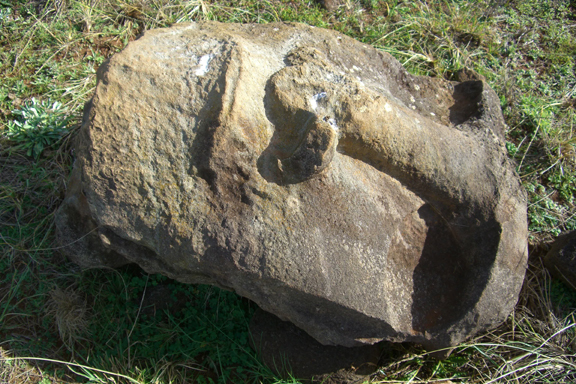 In the interior of Rano Raraku quarry, EISP has mapped and documented every statue in each of their various carving phases, as well as the independent histories of the individual quarries. 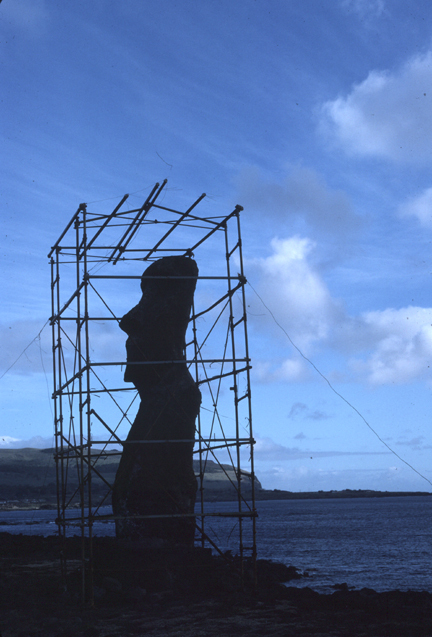 Two statues, famously dubbed “Papa” and “Mama” by Katherine Pease Routledge, co-leader of the Mana Expedition to Easter Island, 1919, were the immediate focus of our attention. We studied specific issues of stone faulting and breakage, and planned a strategy for environmental monitoring, which will be carried out during 2009-2010. 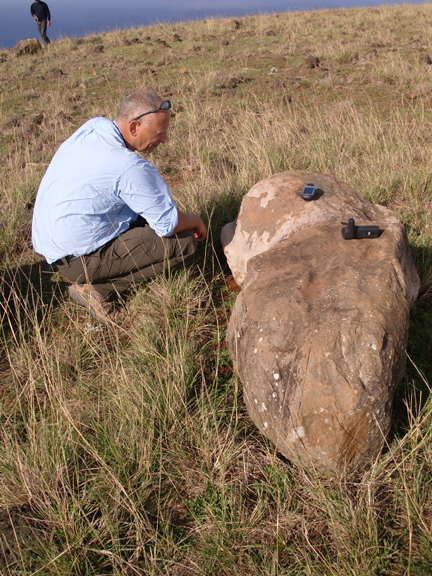 In order to consider the established baseline characterizations of some stone types, Chris Fischer and our team examined statues carved of materials other than Rano Raraku tuff, including trachite and basalts weathered to red-gray. Christian Fischer with trachite statue at Poike. Acquainting ourselves in detail with previous conservation efforts, we examined sites and statues to which various chemical consolidates and other substances had been applied in the past in company with Mónica Bahamondez P.
Head of statue 25-001-018 on Poike. 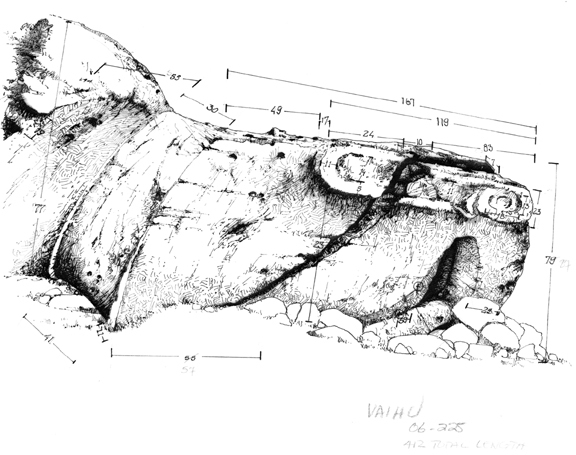 Ahu Vaihu is one of the most instructive sites in terms of environmental damages to the statues’ stone surfaces. Susana Nahoe of CONAF met on site with our team to detail the issues related to the conservation of this highly important site. 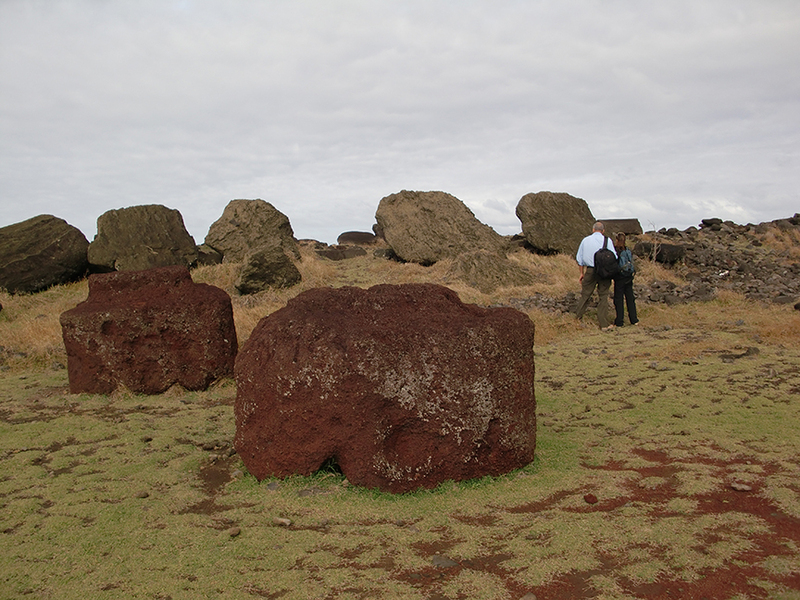 Stone surface conservation experiment conducted at Hanga Kio'E by Chilean museum authorities. EISP is upgrading the project’s digital research tools by compiling spatial data into a Geographic Information System and converting the inventory database to a web application that will allow access for shared research with collaborators. The GIS team, Kim Anh Hoang and Yoh Kawano, has geo-referenced historical data and maps to the current Universal Transverse Mercator coordinate system, fitting the data to the most recently surveyed points. The database development team, Alice Hom and Ewan Branda, evaluated and restructured the current database schema with Jo Anne Van Tilburg to accommodate additional data formats collected by collaborators. The web-based database will offer customized levels of access to collaborators, responding to their security concerns and appropriate usage of their data. Projected for completion in November 2009 are a set of revised standard workflow procedures in place for digital data collection which adapt to current field conditions, and the first phase of the web-based database with unprecedented correlation of historical and recent documentation on each moai. 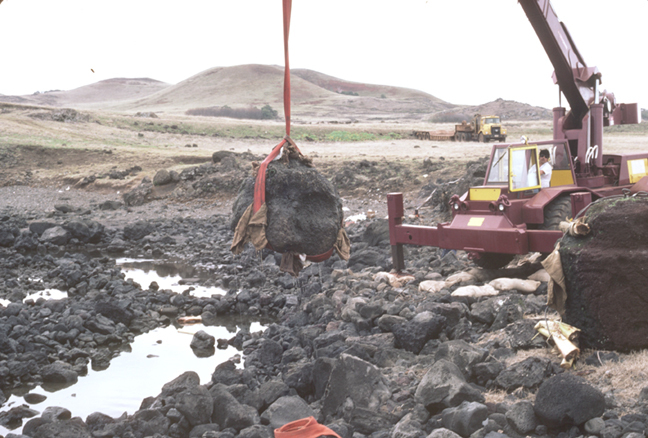 Removal of statue head fragment from bay at Ahu Vaihu in 1986. 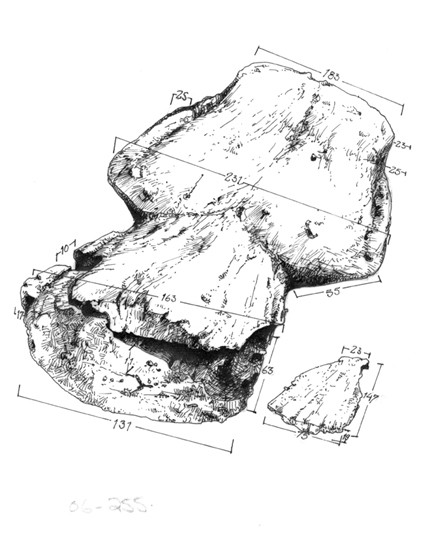 Drawing by Cristían Arevalo Pakaratí showing breakage in statue 06-255-005.